"The Buddha taught that flexibility and openness bring strength and that running from groundlessness weakens us and brings pain. But do we understand that becoming familiar with the running away is the key? Openness doesn't come from resisting our fears but from getting to know them well. In a way, it's thrilling to see that in Train Your Brain to Get Happy: The Simple Program That Primes Your Grey Cells for Joy, Optimism, and Serenity that in chapter 5 Meditation is seen as one of the key ways. Now I'm not sure if happiness is the goal, I mean, you can get happier with more mindfulness, but you can also be more aware of other's suffering and it's hard to keep the deep shadow of that off your happiness. I do think life is more meaningful, more vivid, clear and full. I think there's been a revolution in embracing secular mindfulness by the mental health community, from Marsha Linehan, and on and on. And that's really cool. I certainly use it in my job. But for my money, going into the BuddhaDharma adds so much more to mindfulness. I feel the same way about Mindfulness For Dummies (Book + CD) . It's a wonderful thing if you've used mindfulness. But that's getting off at the first stop of Buddhism, why not go along for the whole ride. That's what I want personally, but of course I believe in pluralism and the individual respect that everyone is responsible for their own spiritual path. 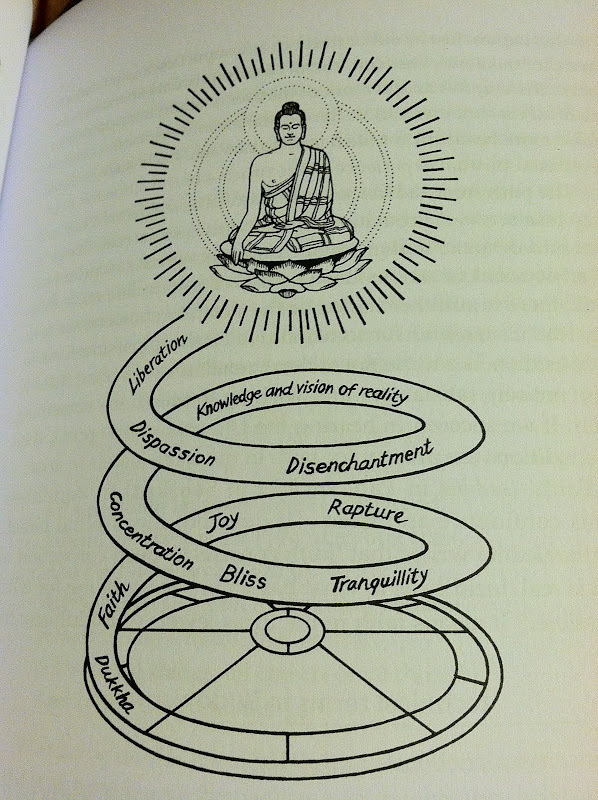 I can trace my conditions of meditation and learning about the BuddhaDharma back to the Buddha. I've been thinking about the 4 sights. The Buddha may or may not have lead a sort of hedonistic lifestyle, but the legend is that his father gave him different pools for different colored lotus flowers, and different "palaces", one that had female musicians. I bet it was fun. But he saw an old person and a sick person and a dead person and a renunciant, a person who had gone forth. Now most people see these things all the time. But Siddhartha Gotama went a bit further, followed his thoughts, developed them. How can I get beyond these problems, transcend them? Can you really transcend them? I think the Buddha did. I think the Buddha saw deeply and pursued his mission. He was given the keys to the ashram twice when he surpassed the teachers of the time, and he passed. Na, there's something more. There are lots of spiritual idols, heroes. I think about Sangharakshita going forth. He gave up everything, and went off into India. He wanted to go to Sri Lanka but since he'd given up his passport, he couldn't. I wonder if the Triratna community would have been more Theravadan if that had happened. I'm sure he could have gotten a passport if he wanted to. The Chutzpah of starting a new Buddhist order. For manjuvajra to come to Boston and then to found Ayraloka. For him to call upon his friends to come and help him. For someone to come to NYC and try to start up a Buddhist community, like Vajramati did and does. To devote yourself to the good of the Dharma. To teach so many people meditation. Then I was open to it. My friend signed me up for the class! I'd watched my stepfather meditate twice a day for many years. I was relatively open and free to appreciate it. I've been toying with creating a course on Udemy, but of course I'm too busy with children, work and my own personal life. But this might be a place I could go to teach some Buddhism, which is really a presumptuous thing to do, but I really think teaching is the best way to learn. I might have to do it if someone else doesn't step up and present an introduction to Buddhism class. There's not much Buddhism at Udemy, but there is a world literature class, and there's a lecture on Han Shan by Andrew Neuendorf. The talk is 20 minutes. Andrew Neuendorf's qualification is that he has a MFA in Creative Writing. Seems he's been a teacher in college for 11 years. There's also a lecture on Wang Wei, which I haven't listened to.